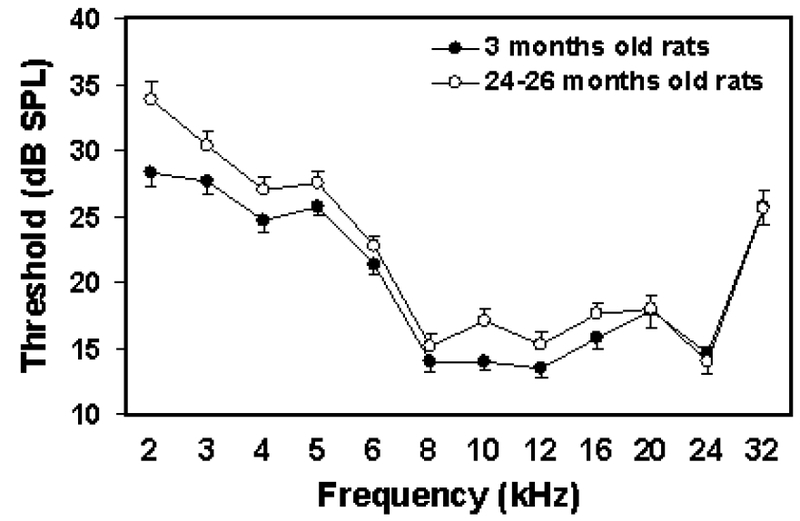 Noise- and styrene-induced hearing and hair cell loss were studied in young (3 months) and aged (24-26 months) Long-Evans rats. The animals were exposed 6 h/d, 5 d/w for 4 weeks to (a) broadband noise centered at 8 kHz (92 or 97dB SPL), or (b) styrene (700 ppm). Auditory sensitivity was tested by recording evoked potentials from the inferior colliculus. Histological analyses of the organ of Corti, stria vascularis, and the spiral ganglions were also performed. Aged controls showed outer hair cell (OHC) loss at the basal and apical regions of the organ of Corti, and an increase in pigmentation concomitant to a decrease in vascularization of the stria vascularis, along with elevated thresholds relative to young controls. The 92-dB noise caused similar threshold shifts in both age groups, whereas the 97-dB noise caused more threshold shifts in the aged group compared to the young group. Recovery of the hearing thresholds depended both on the intensity of the noise and on the age of the animals. Aged rats had minimal hair cell loss as a result of styrene exposure, whereas young animals showed significant OHC loss, particularly in third row. Despite significant loss of OHCs, the young subjects showed styrene-induced threshold shifts only at high frequencies. In summary, the data show that : (a) there is an influence of age on both noise-induced and styrene-induced threshold shift and hair cell loss in rats and (b) the cochlea appear to have a redundancy in the number of OHCs, thus threshold shift does not necessarily occur with significant OHC loss. Results from recent quantitative research consistently demonstrate that children are a high risk group, vulnerable to the adverse effects of noise exposure, especially effects on cognitive performance, motivation and annoyance. The aims of the two qualitative studies reported in this paper are to explore children's a) perception of noise exposure; b) perceived risk of and attitudes towards noise pollution; c) coping strategies; and d) the annoyance response. The Millennium Conference Study involved focus group interviews with an international sample (n=36) unselected by exposure. The West London Schools Study involved individual interviews, conducted with a purposively selected sample (n=18) exposed to aircraft noise. The children in the focus groups reported being most affected by neighbours' noise and road traffic noise, whereas children exposed to aircraft noise were most affected by aircraft noise. As expected, the impact of noise pollution on everyday activities (e.g. schoolwork, homework and playing) was larger for the children exposed to high levels of aircraft noise compared with the low noise exposed children and focus group samples. The range of coping strategies that children employed to combat noise exposure in their lives was dependent upon the amount of control they had over the noise source. 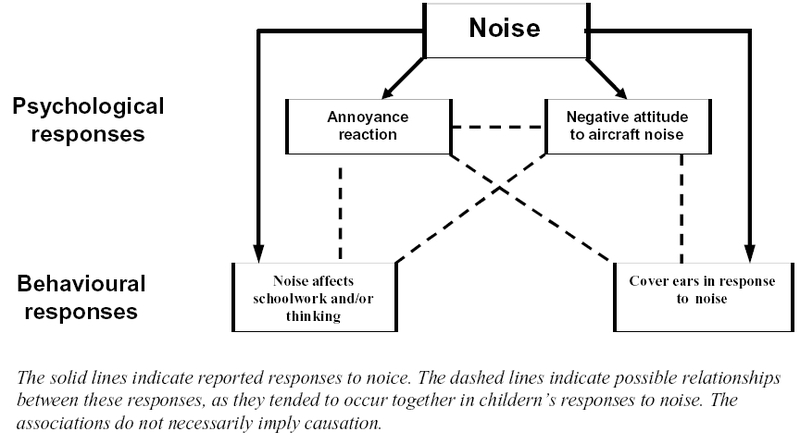 The emotional response of children describing the annoyance reaction to noise was consistent with adult reactions and it would seem that child noise annoyance is the same construct. Future research should employ qualitative methods to supplement quantitative investigations. This article provides a review of three of the most important field studies to have examined the non-auditory effects of chronic aircraft noise exposure on children's cognition and health. The design of each of the studies is outlined, relevant methodological issues are highlighted and the findings from the studies are reported. Effects are reported on annoyance and quality of life, motivation and helplessness, stress responses as indexed by neuroendocrine tests and blood pressure measurements. In terms of cognitive performance, effects are reported on reading, attention and long-term and working memory. The pathogenesis of allergies can be stimulated by adjuvant effects - i.e. air pollutants such as NO 2 and particles from diesel exhausts as well as noise - the latter especially during night-time. During sleep, noise signals which are associated with danger (i.e. lorry noise) have the potential to trigger stress reactions even if the noise level is low. Increases of cortisol in the first half of the night seem to play an important role. In a blind interview study, the combined effects of chronic exposure to traffic related air pollution and noise, upon the risk of skin and respiratory diseases in children were studied. All children between 5-12 years, who had consulted one of two participating paediatricians were included in the study. The paediatricians diagnoses of 400 children were analysed together with their parents answers regarding the density of road traffic on their street and several confounding factors. Multiple regression analyses resulted in relative risks of asthma, chronic bronchitis and neurodermitis, which increased significantly with increasing traffic load. A comparison with the literature on such effects caused by air pollution alone, showed that traffic noise during the night might have an adjuvant effect on the pathogenesis of the mentioned diseases. During the Paleo Festival in Nyon, Switzerland, which took place from 24th to 29th July 2001, ten volunteers were equipped each evening with small sound level meters which continuously monitored their sound exposure as they circulated among the various festival events. Sound levels at the mixing console and at the place where people are most heavily exposed (in front of the speakers) were measured simultaneously. In addition, a sample of 601 people from the audience were interviewed over the six days of the festival and asked their opinion of sound level and quality, as well as provide details of where in the arena they preferred to listen to the concerts, whether they used ear plugs, if they had experienced any tinnitus, and if so how long it had persisted. 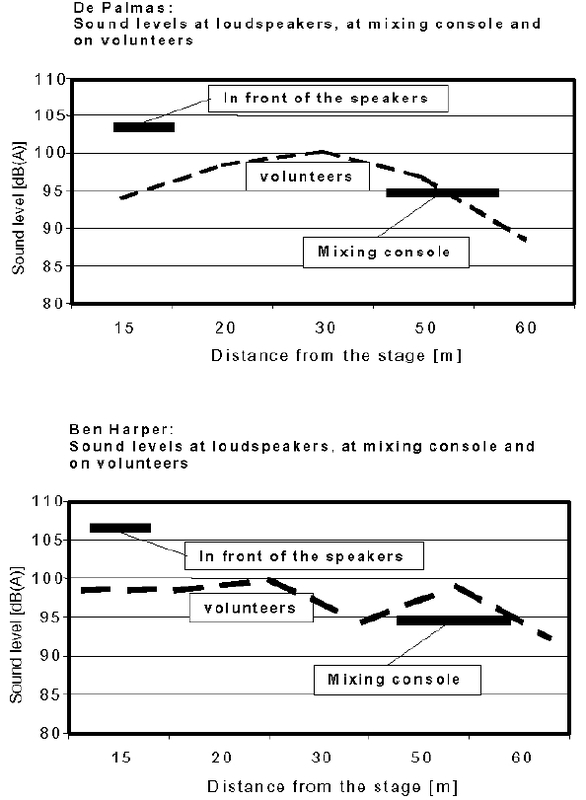 The individual sound exposure during a typical evening was on average 95 dB(A) although 8% of the volunteers were exposed to sound levels higher then 100 dB(A). Only 5% of the audience wore ear plugs throughout the concert while 34% used them occasionally. While some 36% of the people interviewed reported that they had experienced tinnitus after listening to loud music, the majority found both the music quality and the sound level good. The sound level limit of 100 dB(A) at the place where the people are most heavily exposed seems to be a good compromise between the public heath issue, the demands of artists and organisers, and the expectations of the public. However, considering the average sound levels to which the public are exposed during a single evening, it is recommended that ear plugs be used by concert-goers who attend more than one day of the festival. This article presents findings from a European project co-ordinated by the National Institute of Public Health, Denmark. The project Children and noise - prevention of adverse effects was partly financed by the European Commission Programme on Pollution-related Diseases and included partners or consultants from six European Union Member States: Denmark, Germany, Italy, the Netherlands, Sweden and the United Kingdom. The project used a definition of noise based on children's special development and provides examples of good practice on how to prevent the harmful effects of noise in children's daily settings. The settings analysed were day-care centres, primary schools and discotheques. 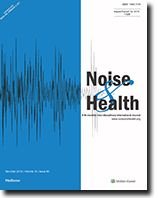 Two methods were applied to obtain the effective examples of noise prevention or noise reduction: reviewing existing research and interviewing key people with knowledge and experience that has not yet appeared in the literature. A range of cases of preventing the adverse effects of noise assessed before and after the intervention provide a number of good practices, including information and awareness-raising campaigns and the identification of key concepts and key players in the prevention of noise. The examples of good practice have been effective in reducing noise, reducing the effects of noise, increasing the awareness of the importance of noise reduction or increasing action to reduce noise. The examples are based on a common format for reviewing preventive measures and can serve as direct inspiration for action to prevent noise in children's daily settings. This study examined the potential risk of hearing loss by commercial radio announcers. This risk is developed through the regular use of headphones. These headphones are used to monitor broadcast transmission and communication information from program producers. To our knowledge there are no published studies of the noise exposure of radio announcers. The experimental method utilised a headphone parallel to the one in use mounted on a wideband, artificial ear. A Sound Level Meter was then used to measure the sound level and then calculate the exposure level. Depending on the feedback level applied to their headphones radio announcers are exposed to potentially damaging levels of noise. Levels measured correlate with results from other studies of long-term average speech spectrum and voice level measurements.